Clear Lake is always a first of the season place to ice fish. The lake is very shallow throughout and freezes very quickly. The beginning of the ice season is also the perfect time to fish the shallow weeds that surround much of the lake. This was our target today as I was joined by David Gissel and Cameron Arnold. 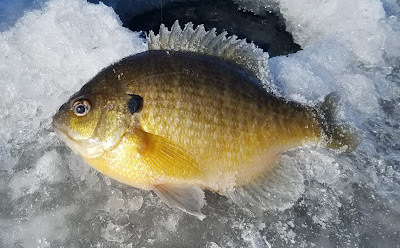 Like many anglers on Clear Lake this year many small perch were caught on the little lake, so after several small moves we made a big move to the big lake. Different locations but same strategy, hit the weeds and find the pickets that the fish were using to move and feed. The water was very clear so sight fishing became the method of choice. Several nice bluegills were had on this day as well as a few yellow bass. The action was not fast and furious, but the size of the gills and yellows surprised us all. This technique gets overlooked at Clear Lake and it shouldn't. Fishing shallow for these moving fish is a fun way to get on some quality fish as we did on this day. Clear Lake didn't disappoint but next time I hope to be chasing down schools of yellows...which is an adventure every time! November 18th marked the first time on the ice for me this year. This was the earliest I have ever ice fished. The unusual fall weather brought enough cold weather to northern Iowa to allow the ice to form rapidly over a week-long stretch. A group of 5 of us traveled to Northern Iowa in search of good ice. We tried 7 locations over the day and ended up fishing on 3 of them. Bluegills, Perch, Largemouth Bass and Catfish were caught. 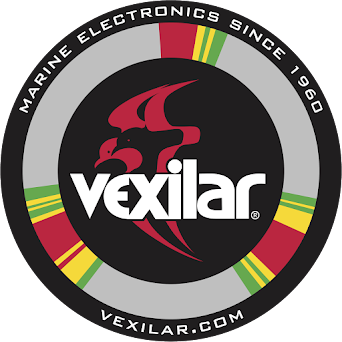 The VEXILAR showed us that the action was steady all day and we all had a good time. It was good to see some ice fishing friends from Des Moines once again. First ice is very exciting, however CAUTION has to be on forefront of any ice adventure, especially early in the season. Traveling in groups is first line of defense, as well as safety equipment; spikes, rope, flotation devices and cell phones. Using a spud bar and or drilling many holes to check the ice is something we all need to do this time of year. Don't take someones word that the ice is ok, check it yourself or simply stay home. 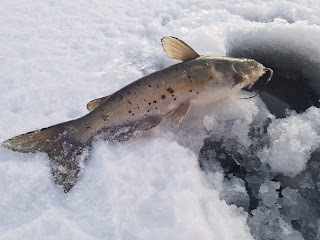 NO FISH is worth taking a chance on unstable ice. Be prepared, travel in small groups and always take in your surroundings in this early ice season. Ice fishing shows in Iowa are in full swing, I was sent to Clear Lake Bait and Tackle last weekend to give a seminar on using flashers to catch more fish through the ice. No matter the crowd there are always a few things that really get the attention of the crowd. Below you will see the most common thing I get asked while doing shows at the beginning of winter. 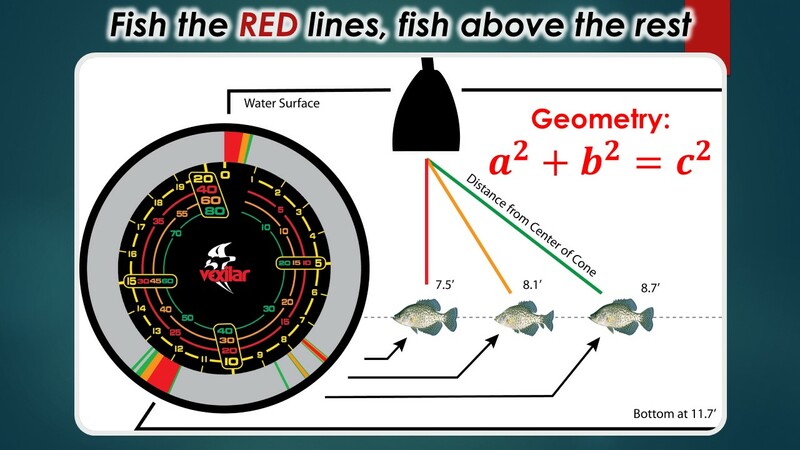 This graphic shows the math behind the lines on your flasher. We need to train our minds that the colors are not the "size" of fish as a lot of anglers assume. The graphic shows how the colors can create a mental picture for us as we decipher what our flasher is telling us. Use the colors to present the baits at the appropriate depths, never go to a GREEN or YELLOW line, always fish above it. Also, always go after the RED lines, those fish are right beneath you and it also tells you at what depth the fish are moving through your water column. 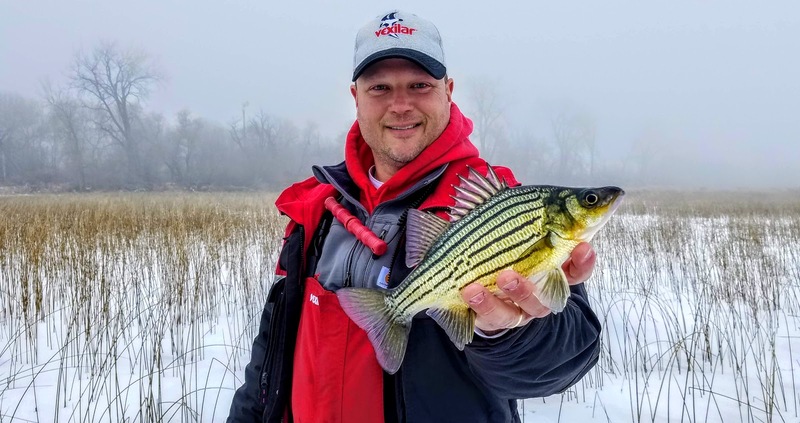 Note, the crappies are swimming all at the same depth, however the lines on the Vexilar will appear deeper as they are farther away from the ice-ducer. This is the reason why we need fish above the yellow and green lines. 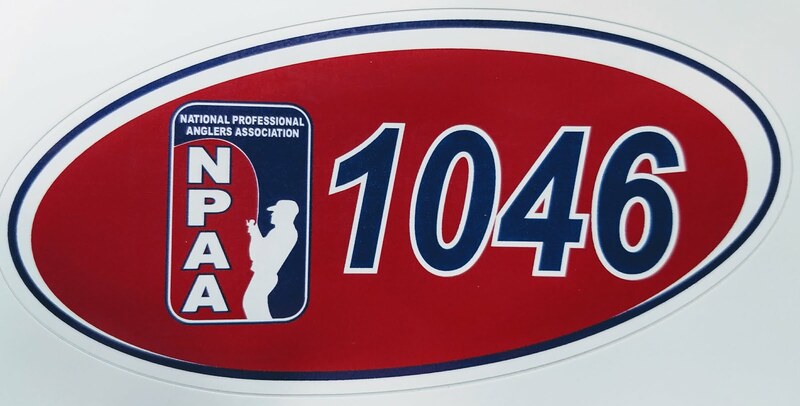 Have fun, be safe and enjoy the upcoming ice season...it might be here before many think!